These two images contrasted together speak volumes. I am sure they were intended to be parallels of each other because Thor looks almost exactly the same, but his predicament is now one of disappointment and desperation. Whereas one conjures images of heroism and resolution the other, sadness and repentance. There was once a time where Thor wielded two Mjölnirs in awe but now he is unable to lift even one, and it is so upsetting to watch him struggle to do so. There isn’t even a purpose in his plight because the moon is desolate and there are no threats towards him. This is a God struggling with himself, in the realisation that he has fallen from grace and is no longer worthy of the crown. He knees is bent wedged into the ground and the other foot held afar to provide grip, as his arms are taught with all his might. His veins and muscles are tense as he arches his back to pull as hard as possible. His eyes are closed, his mouth wide open with a roar, as he once did whilst overcoming the greatest threat to all Gods. His only threat now is himself and his screams are those of woe and sadness. 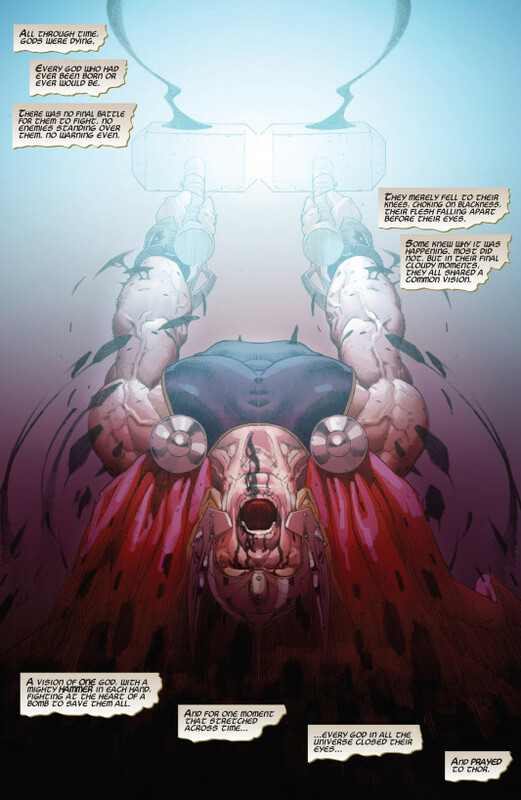 It is a devastating image as Esad Ribic throws Thor into the depths of a simple God, the higher you are the further you fall. This image is difficult to look at, compared the the former which I could stare at all day long. But the most important question Jason Aaron has to answer is why this has happened. One must remember that true heroism comes from within, it was not Mjölnir that made Thor great, it was the man himself. This is the reason why Steve Rogers is such as legend and not afflicted with evil. Unless there was an even in recent times not chronicled in comics then Thor must have a past sin that makes him unworthy. If this is the case then he held that hammer despite his transgressions, and he overcame them which makes him all the more honourable. It is not Mjölnirs that makes him Thor, but the person he is and from what I can tell, that has yet to change. 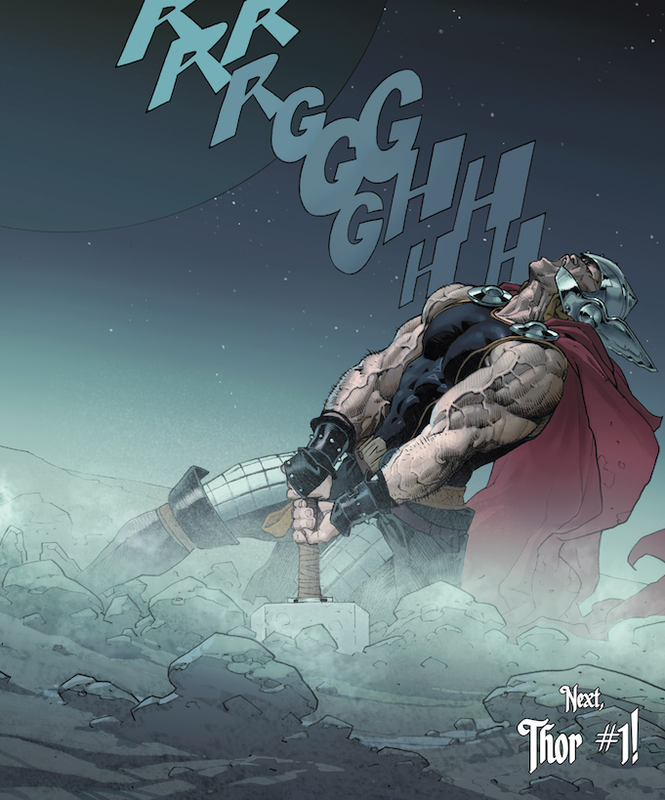 Even in the Thor and Loki book, the Odinson was as determined and resolute as he has ever been in the face of evil. His actions were of better intentions than his mischievous brother. So when did this event occur that made his fall from grace so catastrophic? And why did the old Nick Fury have to whisper this truth in order for it to be realised by Mjölnir? These questions are no doubt difficult to answer and I worry they will be answered poorly, especially when we are trying to rewrite continuity and insinuate that it is Mjölnir that makes a Thor and not the Odinson himself. In the meanwhile we should take time to appreciate Ribic’s most amazing artwork and shed a tear that we will not see him drawing Thor so wondrously or as epically. I am not one to lose belief so easily and I will continue to look at the God trying to reclaim his hammer so emphatically because I still believe in Thor. Previous PostThe Theatre List 17/9 – What didn’t you recommend?